Treatments for glaucoma, including glaucoma lasers, are aimed at lowering the eye pressure (intraocular pressure) in order to prevent damage to your optic nerve. Unfortunately, treatment cannot repair any damage or reverse any visual loss that may have already occurred. Regular monitoring and subsequent early detection and treatment are therefore vital for the prevention of blindness from optic nerve damage. How much lowering of eye pressure is required depends on how severe the optic nerve damage is. In general, normal eye pressure ranges from 8 to 21 millimeters mercury (mmHg). Ophthalmologists tend to start treatment if the pressure exceeds 30 mmHg. The ideal intraocular pressure level for most glaucoma patients is 14 mmHg or lower. There are 3 main types of glaucoma laser treatments that are used to reduce intraocular pressure: argon laser trabeculoplasty, selective laser trabeculoplasty and cyclodiode ciliary ablation. 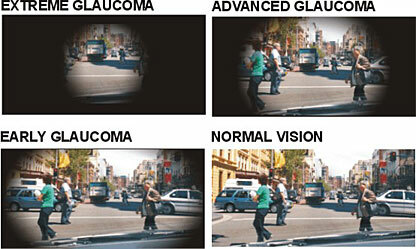 These glaucoma laser treatments are considered minor procedures, and you should recover from them relatively quickly. These work by either stimulating outflow of aqueous humor (the natural fluid in the eye) through the trabecular meshwork or by reducing aqueous production from the ciliary body. Although successful in lowering the intraocular pressure, they may need to be repeated. You may still need to use glaucoma eye drops in the long-term after laser treatment in order to maintain low eye pressures. Sometimes, even though the laser has been successful in bringing the intraocular pressure down, glaucoma surgery is still required to lower the pressure even more to further reduce the risk of deterioration from glaucoma. However, as surgery is associated with complications, it should only be performed after careful assessment of its risks and benefits. Anesthetic eye drops are usually sufficient to numb the eyes for glaucoma laser treatment although sometimes you may need an anesthetic injection. 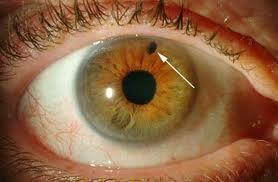 A special contact lens is placed on your eye while you are seated at the slit lamp. A targeting beam is then aimed at the structures that require lasering via the contact lens. The whole process often takes no more than 15 minutes to perform. These treatments are done on an outpatient basis. Argon laser trabeculoplasty (ALT) is a laser that acts on the trabecular meshwork of the eye. It acts by stimulating the trabecular meshwork cells to increase drainage of aqueous fluid out of the eye. ALT is most commonly used for glaucoma patients with pigmented open angles. The main complications after ALT are due to the high energy used; these include inflammation of the eye, raised intraocular pressure and scarring of the drainage angle. As the potential damage and scarring to adjacent tissues can be permanent, it is not recommended that ALT be used more than twice. Argon laser trabeculoplasty involves the placement of high-energy laser burns at the trabecular meshwork. Doing this increases the drainage of aqueous through the meshwork and out of the eyeball. Although ALT has been around for several decades, the exact mechanism of how it works is still unclear. Selective laser trabeculoplasty (SLT) also works by stimulating the trabecular meshwork to drain aqueous fluid out of the eye. Selective laser trabeculoplasty is most commonly used in open angle glaucoma, including those with less pigmented angles. It is similar to argon laser trabeculoplasty in terms of how it works, but the main difference is that the energy level used is much less and so there is minimal (if any) damage to surrounding cells and minimal scarring of the drainage angle. Therefore, in contrast to ALT, SLT is a laser procedure that can be repeated more than once. However, complications after selective laser trabeculoplasty do occur, and these include inflammation of the eye and raised intraocular pressure, both of which are usually short-term. Both ALT and SLT are equally effective when compared to eye drops and to each other in lowering eye pressure. Treatment repeatability is not the only difference between ALT and SLT. In ALT, the treatment spot size is smaller (50µm) with large gaps in between (white arrowhead; left). In SLT, the laser spot size is larger (400 µm) with no gaps in between (white arrow; right). Cyclodiode ciliary ablation is the most destructive of the 3 procedures. This glaucoma laser treatment acts on the ciliary body and destroys it. This reduces the amount of aqueous produced and lowers the intraocular pressure. As it can be painful, the procedure is usually performed after your eye is numbed with an anesthetic injection. Unlike laser trabeculoplasty, cyclodiode laser is performed without the need for a slit lamp or contact lens. Due to its destructive nature, it is generally reserved for eyes that already have poor vision and/or are painful due to high eye pressures, although exceptions do occur. 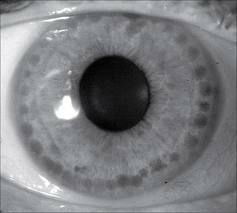 The commonest complications after treatment are persistent inflammation and low eye pressure. There is also a rare risk that cyclodiode laser could cause persistent inflammation in the fellow eye. In cyclodiode ciliary ablation, no contact lens is used. The laser probe is placed on the sclera directly opposite where the ciliary body is located. The emitted laser is converted into heat energy which burns and destroys the ciliary body cells. This is performed over 360 degrees around the entire ciliary body. There are 2 main types of glaucoma laser treatments that are used to widen the anterior chamber drainage angle for angle closure glaucoma: laser iridotomy and laser peripheral iridoplasty. Widening of the anterior chamber drainage angle allows better outflow of aqueous from the eye and may therefore also help to lower the intraocular pressure. 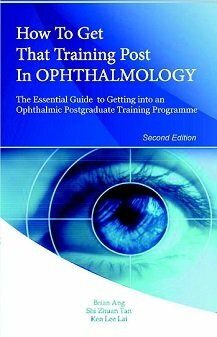 However, you may still need to use eye drops in the long-term to maintain your eye pressures at a low level. These types of glaucoma laser treatments are also considered minor procedures and you should recover from them relatively quickly. 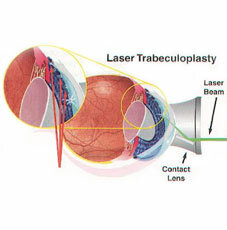 As with laser trabeculoplasty, anesthetic eye drops are usually sufficient to numb the eyes for these glaucoma laser treatments although sometimes an anesthetic injection may be required. A special contact lens is placed on your eye while you are seated at the slit lamp. The laser beam is then targeted at the structures that require lasering via the contact lens. The whole process often takes no more than 15 minutes to perform. Laser treatments are done on an outpatient basis. Laser peripheral iridotomy (laser PI) means the creation of a full thickness hole (white arrow, right) in the iris periphery with the laser. Prior to the laser iridotomy treatment, you will receive pilocarpine eye drops to constrict the pupil. These drops will blur your vision and also give you a headache. This opening in the iris allows aqueous fluid to drain through this channel, widens the drainage angle, and lowers the eye pressure as well. 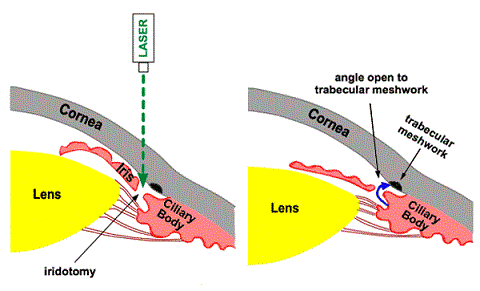 Laser iridotomy is the first line laser treatment for angle closure. It is important for the prevention of acute angle closure glaucoma in those who are at risk. Laser iridotomy is a very safe and effective procedure. It has a 75% success rate of widening the drainage angle. The main complications after laser are inflammation, mild bleeding in the eye, elevated eye pressure, and cataract. Sometimes you may experience visual disturbance and glare due to entry of light via the iridotomy site. This is not harmful to the eye and generally settles, but can be annoying and sometimes does not resolve. Argon laser peripheral iridoplasty widens the drainage angle by shrinking the peripheral iris tissue. It is commonly used in cases where laser iridotomy had been performed but was unsuccessful in opening up the drainage angle. In comparison to laser iridotomy, iridoplasty more uncomfortable because more laser shots are required. Taking some painkillers beforehand can help to take the edge away during glaucoma laser treatment. Occasionally, anesthetic injections may even be required. The main complications after laser are a distorted pupil (which may never return to its original shape but should not affect the vision) and persistent inflammation and discomfort. Instead of the creation of only 1 hole (or 2 at most) at the top part of the iris (as with a peripheral iridotomy), laser peripheral iridoplasty involves applying laser throughout the iris periphery over 360 degrees. Each laser spot size is around 500 µm. If the drainage angles do not widen despite multiple iridoplasty treatments, then the next step would be to undergo surgery.